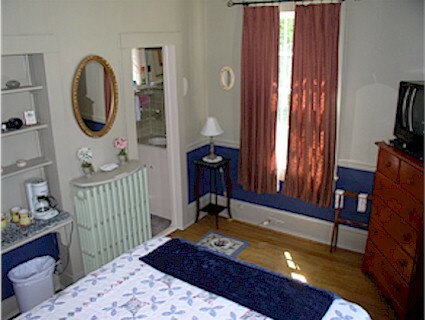 Guests have a variety of room options from a single room to renting the entire Inn. All rooms have private baths, heat and air-conditioning. We have a room with a private outside entrance that is fully handicapped accessible. Whatever your needs, we can more than likely accommodate them. We also offer in-season and out-of-season rates. See our policies page for details on reservations, payment options, check-in times and more. Click on thumbnail images below to see individual room descriptions: rooms 1, 2, & 3 are all down stairs rooms while rooms 4, 5, & 6 are all second floor rooms.